Premier League Champions Manchester United Party in Manchester City Cab! After winning the Premier League for the 20th time, Manchester United players partied as they hopped in a black cab which had their close rivals advertised on the car. 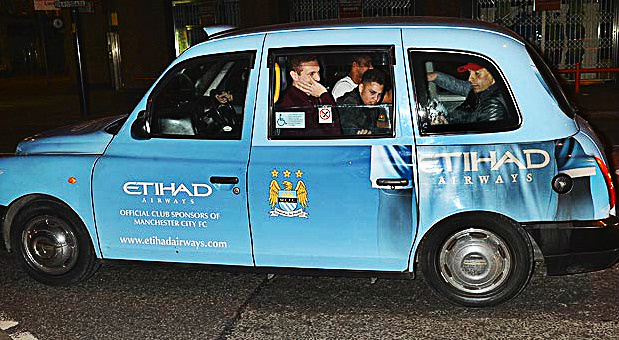 The cab contained players such as Rio Ferdinand, Nemanja Vidic & Anderson which took them to a night club around about 2 in the morning. Derek Izzit, the owner of the cab said "It's the only one in the city decked out in sky blue." Maybe the Manchester United players were taking the mick! Sir Alex Ferguson's squad partied all night after their 3-0 win against Aston Villa which won them their 20th Premier League title. So what do you think? Were they taking the mick or just in a rush? Leave your comments below!